La fin du Ps 50, dans les versets 16-23, intègre ce Psaume dans la perspective de la rédaction finale du Psautier d’une opposition entre le juste et l’impie. 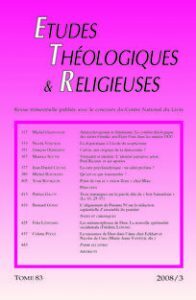 Bernard Gosse montre que l’influence de la tradition de Sagesse du livre des Proverbes y est très présente. At the end of Psalm 50, the verses 16 to 23 integrate the psalm into the perspective of an opposition between the just and the wicked that is characteristic of the final redaction of the Psalter. Bernard Gosse shows how such views have been influenced by the wisdom tradition of the book of proverbs.